If you are considering creating a new co-operative business in the Worcester area or converting an existing business into a co-op, contact Worcester Roots for information on how we can help! What does Worcester Roots offer? Worcester Roots organizes Co-op Academies with curriculum on mission/vision/values, meeting facilitation, conflict mediation, financials, market analysis, youth in co-ops, legal documents, membership and governance, greening the co-op, raising capital, and more. Much of our popular education and youth-focused curriculum is available on HERE on our website or at cultivate.coop HERE. In addition to the Co-op Academies mentioned above for in-depth mentorship, training, and support; we also offer over-the-phone or short-term advice year-round. For some co-ops that have a lot of mission match, we provide full incubation support and fiscal sponsorship for up to three years. The academy and incubation include one-on-one coaching with a successful entrepreneur, access to a peer-support network beyond the training, legal assistance with business incorporation & structuring, greater visibility and name recognition for your co-op, training and support in fundraising, web site development, and logo design. We also make referrals to appropriate technical assistance and financing institutions. Find out about Co-op Training Intensives here! 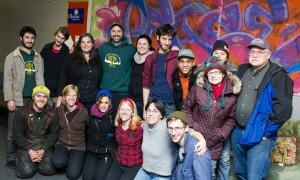 Worcester Roots connects existing co-ops, individuals with interest in co-ops and cooperatives-in-formation as an ecosystem through regular events, trainings and the Worcester Solidarity And Green Economy (SAGE) Alliance. Access this network of dozens of groups and hundreds of Worcester residents by collaborating with Worcester Roots. Working with Roots also connects you to national and international networks, including the Eastern Conference for Workplace Democracy, US Federation of Worker Co-ops, New Economy Coalition and Grassroots Global Justice. Worcester Roots focuses on organizing, not traditional technical assistance or service provision. We work with our community to strengthen the movement, connect to resources and build power. We model the co-op structure in a our staff arrangement, using a staff collective, active board, and horizontal decision-making. Interested in Fiscal Sponsorship? Fill out this form! Prezi about Union Co-op Approach here. International Co-operative Alliance defines a cooperative (or “co-op”) as an autonomous association of persons united voluntarily to meet their common economic, social, and cultural needs and aspirations through a jointly-owned and democratically-controlled enterprise. Also, check out our RESOURCES page. Check out more about our Co-op Academy HERE. For more information, please contact us at info@worcesterroots.org.